Available in many styles, this is our most basic and popular - solid sterling silver. It is hand-forged in our studio, and the medic alter symbol is raised and soldered onto a comfortably curved oval bracelet plaque. The bands have clasps on both sides, so that they are interchangeable. We offer leather with sterling components in many colors, as well as a solid sterling chain. This listing is for one bracelet, with your band of choice - leather or sterling chain. Leather colors are: Crimson, Light Rose, Burgundy, Sky Blue, Hot Fuscia, Saddle Brown, Espresso Brown, Jet Black, Natural Beige, Denim Blue, Lavender, Bright Turquoise, and Chalk White. Please indicate your desired bracelet length in the comments section upon checkout, along with whether you'd like the sterling chain or one of the leather bands. The information on the back can be left in the comments. My smallest all caps font can do 5 lines of varying length, and my standard fonts 3-4 lines, just 12-17 characters each. ♥ Most retail items ship within about 2 WEEKS from order date. Every single piece is sawn, hammered, pierced, filed, oxidized, buffed, and finished by hand - right here. We take great pride in our work, and even though our processes might be a bit slower, they are time-honored with classic proven quality. If you want the best hand-hewn look, you have come to the right place. ♥ *all domestic orders* ship USPS Mail unless requested otherwise. *all international orders* ship regular uninsured airmail unless requested otherwise. 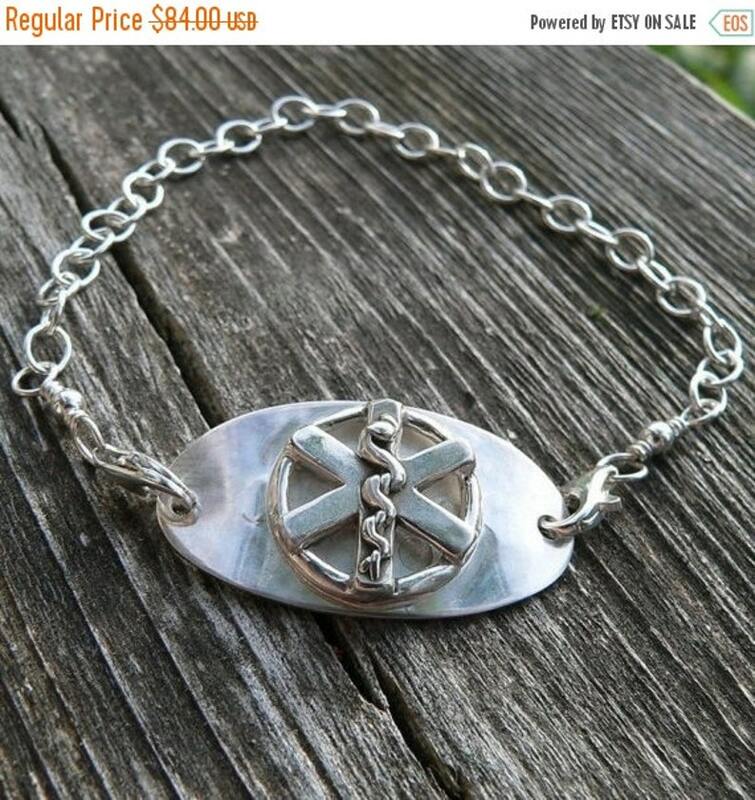 Sterling Silver ID or Word Bracelet (or Medical Alert) Hand Stamped with Any Name, Condition, Word, or Short Phrase.